Small - $39.99 Only 4 left! Are you facing off against every single challenger who comes to your door, looking for a fight? Well, maybe it’s about time you thought about getting a few bodyguards. You need some kind of elite guard force to deal with all the crazy riffraff characters that come knocking on your door who aren’t really worth your time. Emperor Palpatine had his own guard and so does Supreme Leader Snoke, so really, it’s about time for you to start putting together your own version. The best place to start is your child. Wouldn’t your kid make for the perfect Captain of your own guard? He’s already got a fierce fighting stance, doesn’t he? And he probably has enough energy to keep the rest of the guards in line. He’s certainly the best candidate for the job! 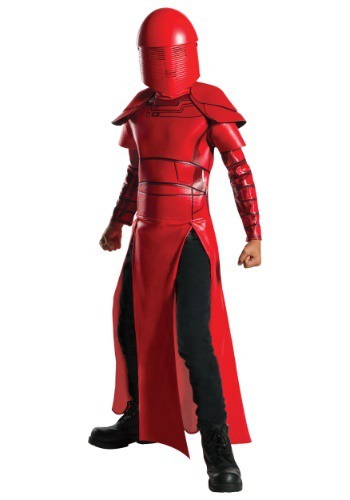 Lucky for you, this child deluxe Praetorian Guard costume lets your child look like one of the guards from Star Wars: The Last Jedi! This deluxe costume is any young Star Wars fan’s dream. It comes with all the pieces needed to start your Praetorian Guard off the right way. It comes with a bright red robe with attached shoulder pieces that recreate the style seen in the movie. It also comes with a mask that has a menacing look, perfect for intimidating those who might try to challenge your young one’s authority. Make sure you that you teach him a few of your patented combat moves to have him ready for anyone who comes looking for some trouble!